When cooked: pasta (87%), [wheat flour, natural colour (carotene)], carrot (contains sulphites), onion, maltodextrin, maize starch, chicken (0.7%), salt, natural flavours, mineral salts (508, 451, 452), yeast extract, wheat flour, curry powder, parsley, sugar, sunflower oil, food acid (malic). Allergens:Contains wheat, milk, soybean, sesame products and sulphites.Blended on equipment that also processes products containing egg, peanut, fish and crustacea. Cooking time: 10 minutes Stove top - for best results 1. Bring 1¼ cups (310mL) hot water, 1 teaspoon Flora Salt Reduced and Seasoned Rice to the boil, stirring. 2. Cover and simmer for 10 minutes. Remove from heat, stir, replace lid and stand for 2 minutes. Microwave (900W) – cooking times may vary. 1. 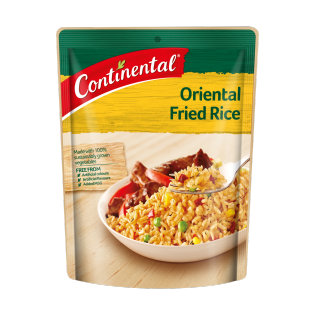 Combine 1½ cups (375mL) hot water, 1 teaspoon Flora Salt Reduced and Seasoned Rice in a microwave safe bowl. 2. Cover and cook on HIGH for 8-10 minutes. Stir, replace cover and stand for 2 minutes before serving. Cook a complete meal in 15 minutes. Go to our website for delicious one pan meal ideas. Your recipe stipulates using 2 teaspoons of rice!!! This is definitely incorrect. Could I have the correct measurements please.